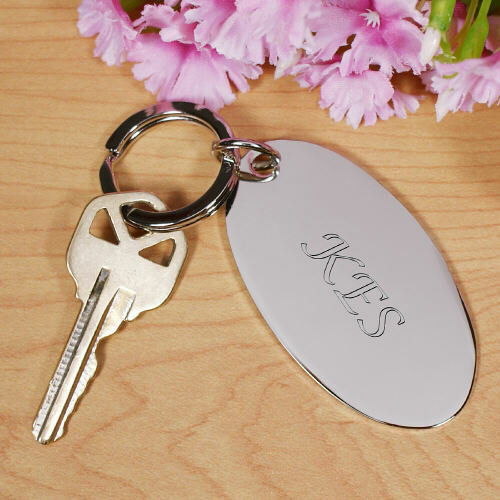 Classic and timeless both describe our handsome Engraved Silver Key Chain. An inexpensive Personalized Gift which is practical and functional while looking great day after day. Present your Mom, Dad, Grandma or Grandpa with this distinctive silver keychain; also makes a great Mother's Day keepsake, birthday or graduation gift. Our Personalized Silver Oval Key Chain measures 1 3/8" x 2 1/2" with key ring. Includes FREE Engraving. Personalized your Oval Silver Keychain with any name or 3 letter initials and select script or block lettering. Silver Oval Key Chain measures 1 3/8" x 2 1/2"
The key chain was exactly as expected, and I liked it. It is a gift for my great-nephew. Additional Details GiftsForYouNow.com has many additional Personalized Mother's Day Keepsakes certain to be well received by Mom, Grandma or Nana. All of our Engraved Gifts include FREE personalization and are always at the lowest prices. Shop GiftsForYouNow.com today for timeless personalized gifts with style.